Day Two of EAT! week was supposed to be a skate–nothing on the menu that I hadn’t cooked and eaten a dozen times. But . 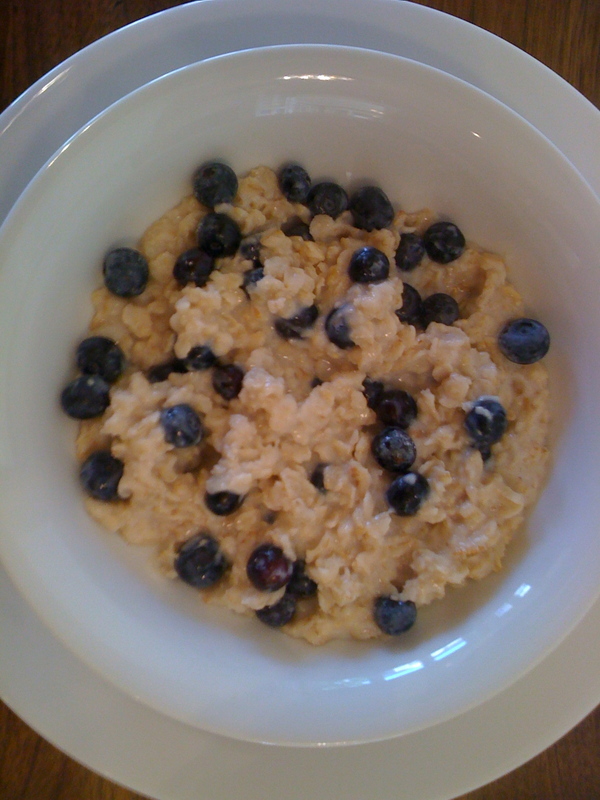 . .
How can a bowl of oatmeal with blueberries go wrong? As I stirred the bubbling pot of cereal, I found myself noticing that the familiar old cardboard cylinder it came in looked a little . . . tired. When did I buy it? I turned it over: “Best before Jul 10 ’09.” Ack!–Was I breaking Mindful Munching Rule #2? (“Don’t eat Pharaoh Food–food so thoroughly preserved that it lasts millenia.”) The ingredient list on the carton was reassuring: “Ingredient: 100% Natural Whole Grain Quaker Quality Rolled Oats.” So if it was well-preserved, it came by it honestly. I’m currently reading Jonathan Bloom’s American Wasteland (see “What I’m Reading” soon for a review), so I decided to get his take on “best before” dates. He has much to say on the subject, but for dry cereal, here’s the nut (p. 166): “Shelf-stable groceries such as cereal . . . are tossed . . . even though [they] wouldn’t go bad for years.” (He blames a “cult of freshness.”) So, I’m not sure I’ll take two years (!) to eat my next box of cereal, but at least it appears that I won’t drop dead from finishing this one. Now about those blueberries. Beautiful! But I’m a skeptic now, so I take a closer look at the clam-shell label: “Product of Chile.”–So much for “eat local!” I have to confess, however, to a lack of zealousness on this point. As I said in an earlier post, I eat bananas. I drink tea. Also, I’ve visited several countries in Latin America (Guatemala, Peru, Brazil, Mexico always and often) and in the course of a couple of those trips I’ve met farmers, coffee growers, and dairy operators. Many run sophisticated family operations and most of the rest are hustling to get there. Can’t we eat some of their berries in winter, and offer them some of ours in summer? Can we prefer local, but make room for global? I understand the issues around energy and transportation, but I’m also sympathetic to people working hard to produce beautiful food and make a better life for their family. What do you think?–Let’s discuss. Just a simple salad! Okay, the grape tomatoes and green onions were from California, but after my breakfast blueberries, that seems like just down the street. 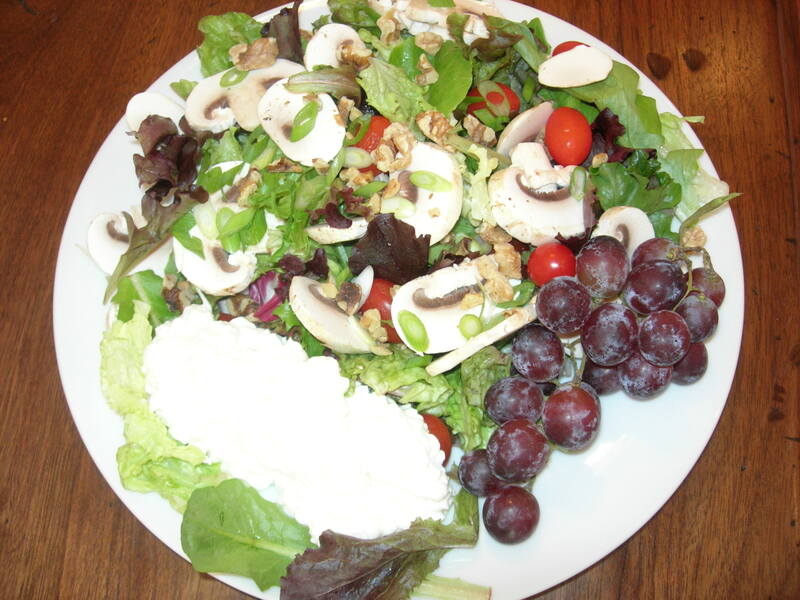 I’m golden on the greens, mushrooms, and cottage cheese–local as in my own county! The grapes?–Well, Whole Foods, but now that I think about it, beyond that I have no idea. The walnuts?–From . . . Costco. My friend Kathy bought a bale of them and gave me a big bag. And actually, the vinaigrette used vinegar from California and olive oil from Portugal. Its Dijon mustard? Grey Poupon, now owned (I see) by Kraft, so probably from anywhere/everywhere. And does anybody actually know where salt and pepper come from? Oh my. Who knew that it would be so hard to know what you are eating! Stay tuned; I’m going to dig around on this and see what I can find out. Let’s start off strong–I know exactly where the lamb shank came from: it came from a lamb raised by Paulette Lefever in Goldendale, Washington. And the carrots and broccoli are as far as I can tell local. The butternut squash, not so much; my first clue was the brand on the little label stuck on it: Si Senor. Product of Mexico. But at least I know! The orzo I used, on the other hand, was a national brand, so once again, probably made anywhere/everywhere. The lemon I squeezed on the broccoli didn’t have a sticker, but let’s face it, it sure didn’t come from here; maybe California? maybe Mexico? 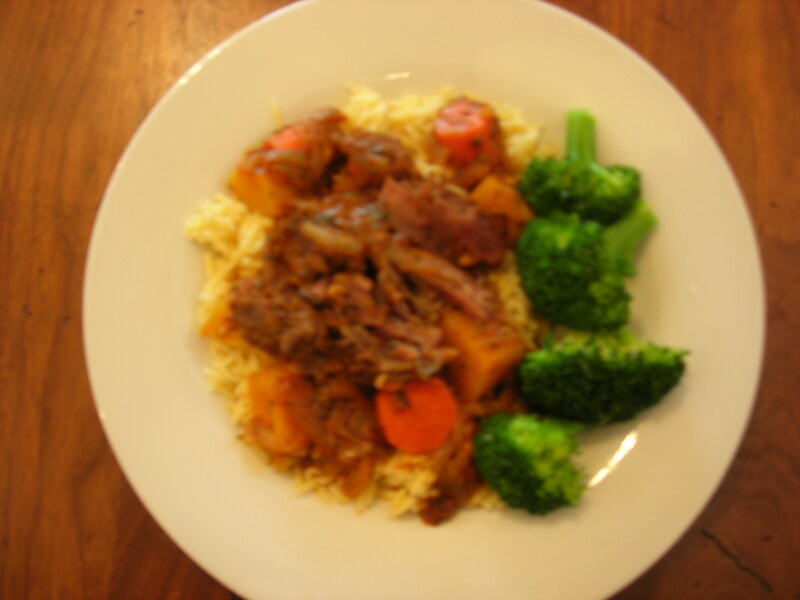 The ton of spices in the braise–definitely from around the globe. I’m beginning to feel a certain lack of clarity about what I’m trying to do here! So let’s review: I want to eat well. I want to use fresh, local ingredients when I can. I want to waste as little as possible. I want to know where my food comes from and how it was produced. And I want the same for everybody else, whether or not their income matches mine. Are some of these goals mutually exclusive? Overall score for Day Two: C. Just muddling through.